Last month I introduced you to Petit Vour, a US-based luxury, cruelty-free and vegan beauty box. I loved my first box and was super surprised and pleased to find out that the lovely people at Petit Vour were sending me this month's box too! 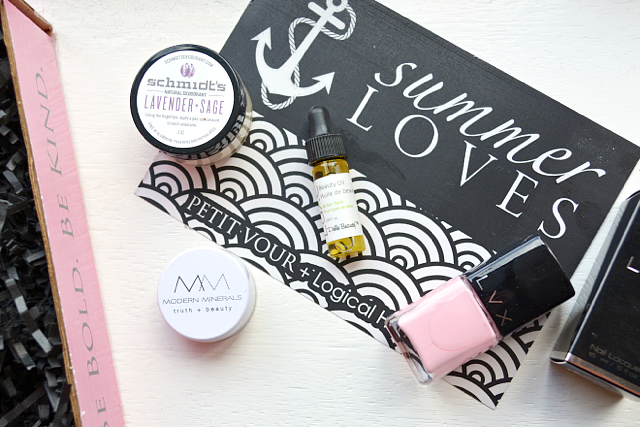 July's Petit Vour Beauty Box* is a collaboration with vegan lifestyle blogger Tashina from Logical Harmony. The box contains 4 products this month; a selection of high performance summer beauty must-haves. I'm loving being introduced to so many brands that I hadn't heard of before, with the exception of Schmidt's! I've heard a lot about the deodorant from the raves of US beauty bloggers so I'm intrigued to try it out. The Modern Minerals Eyeshadow is a really gorgeous shimmery neutral with a kind of mauve tone to it. I'm far from being an eyeshadow expert so I'm really glad I received an easy-to-work-with neutral shade! Pelle Beauty seem like a great brand judging by their clean ingredients. The Luxe face oil certainly does smell luxurious with it's floral scent! It's suitable for all skin types and has an anti-aging formula for revitalising lackluster complexions. Finally there's a nail polish from 5-free brand LVX in a perfect pastel pink shade called Lolli - ideal for summer! This month's box is worth around $39 (approx. £22) which, like last month, is particularly great value for money if you live in the US. The monthly subscription to Petit Vour costs $15 in the US, $23 in Canada and $30 (approx. £17) to ship internationally. What do you think of this beauty box? Are you tempted to try Petit Vour next month? !